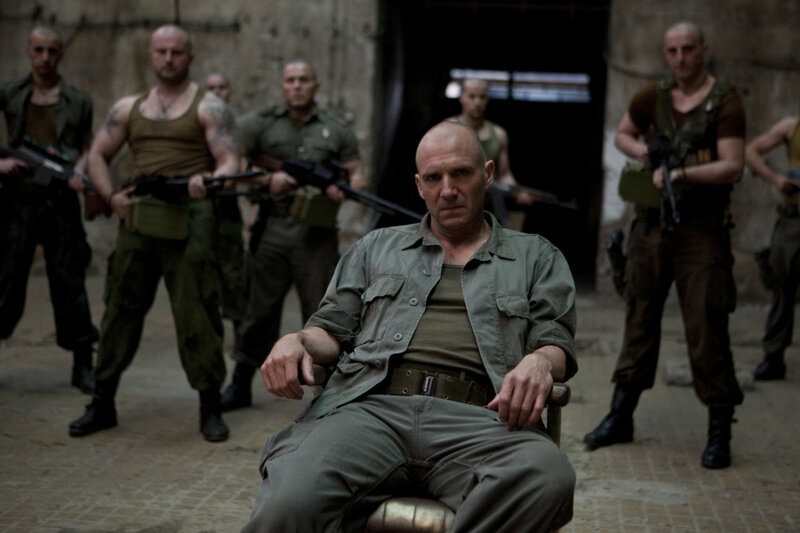 This post originally appeared at the International Feminist Journal of Politics blog on 20 September 2016, accompanying my article ‘”Ancient Volscian border dispute flares”: representations of militarism, masculinity and the Balkans in Ralph Fiennes’s Coriolanus‘ (International Feminist Journal of Politics 18:3 (2016): 429-48). In the first duel between the two feuding generals who serve as protagonist and antagonist in Ralph Fiennes’s cinema adaptation of Coriolanus, a bloodied Roman commander in grey-green digital camouflage uniform, bulked out by tactical pouches, radio equipment and the personal paraphernalia of US forces’ urban combat in the aftermath of the 2003 invasion of Iraq, confronts the leader of the barbarian Volscians, a bearded paramilitary in plain green fatigues whose irregularly dressed and lightly equipped forces resemble countless still and moving images of fighters from a very different yet equally ‘post-Cold-War’ conflict, the Yugoslav wars of the 1990s. The contest between Coriolanus, the Roman war hero who turns away from political acclaim to fight alongside the very barbarians against whom he won his battle honours, and Aufidius, the Volscian leader who moves from admired adversary to counterpart to the agent of Coriolanus’ death, is a historical rivalry from the early stages of Rome’s wars with the Volsci in the 5th–4th centuries BC, adapted into a tragedy by William Shakespeare, and understood by Fiennes (both director and star of this 2012 adaptation) as a narrative that purports to reveal timeless truths about men and war. 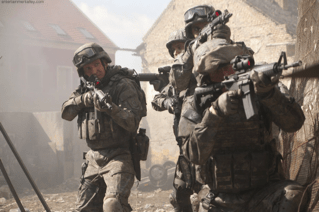 The materiality of the film’s production design, on the other hand, could hardly be more time-bound: not only are the identities of each army and polity conveyed through resemblance to forces from a different newsworthy war, but Fiennes and his production team visualise the competition between the two men through directly opposing two military masculinities, the combat soldier of the post-9/11 War on Terror (representing a state that US liberals have been likening to Rome since its founding days) against the paramilitary of post-Yugoslav ethnopolitical conflict, as pictured in news photography including Ron Haviv’s famous ‘Blood and Honey’ series.The choice to make the film on location in Serbia and Montenegro meant that ruined post-Yugoslav locations in Belgrade, Pančevo and Kotor add verisimilitude for any viewer who remembers news images from the Yugoslav wars, as sites supposed to have been devastated by the Roman–Volscian conflict – even though the destroyed hotel where Coriolanus and Aufidius fight their first duel is none other than the (now refurbished) Hotel Jugoslavija in Belgrade, which owes its ruins not to either side in an ethnopolitical conflict but to a NATO air strike during the Kosovo War in 1999. Archival news footage from (on almost every occasion) the Yugoslav wars (one early riot scene contains a clip from a protest in South-East Asia; none of it comes from the war in Iraq) further localises the action in not so much the material Western Balkans but the imagined space of ‘ancient ethnic hatreds’ into which one of the two most prominent Western discourses about the wars transformed the Yugoslav region. 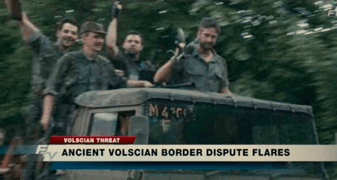 The blurring of ‘found footage’ and scenes staged and designed in resemblance to it sees, in one exposition sequence, Gerard Butler’s Aufidius and three other Volscians cheering and waving rifles as they drive into conquered or liberated territory, above the rolling headline which gave my International Feminist Journal of Politics article the first part of its title: ‘“Ancient Volscian Border Dispute Flares”’. The caption does not give us the ‘ethnic’; alongside these images juxtaposed with concepts of ancientness and territory, it does not need to. With the built environment and the thematics of exposition situating the film’s imaginary space so much more within (a certain Western construction of) the Yugoslav wars than within any post-9/11 conflict – and with a Serbian costume designer, Bojana Nikitović, and the Serbian actors portraying several supporting military characters contributing their own awareness of the aesthetics of the Yugoslav wars – the chief means of distinguishing the Romans and Volscians becomes the aesthetic differences in the embodied military masculinities of each side. Indeed, the psychological narrative of Coriolanus’ rivalry with and admiration of Aufidius – which will end in Coriolanus’ death at Aufidius’ hands after his wife and mother have persuaded him to make peace and return to Rome – is visualised through the transformation of Coriolanus’ and Fiennes’s own militarised body into a persona that several UK film reviewers independently likened to ‘a Balkan warlord’. Coriolanus’ death at Aufidius’ hands, after his wife and mother have persuaded him to make peace and return to Rome, thus becomes simultaneously the resolution of the tragedy, the blade finding (as Fiennes explains in his director’s commentary) ‘its place of penetration’, and Fiennes’s imagination of a ‘weird ancient tribal blood rite of embrace and sadness’ (the hero slain by his dualistic rival yet again?) – a homoerotics given thematic unity by the enactment of ‘ancientness’, killing and tribalism in a ‘Balkan’ setting. 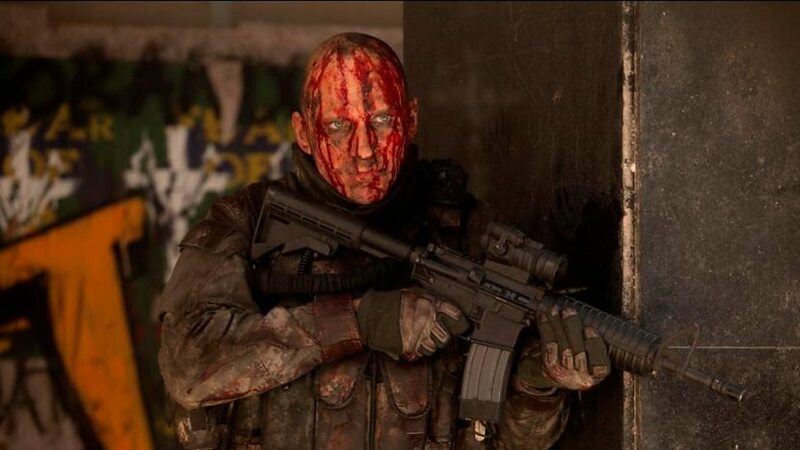 Coriolanus, the film, reached nowhere near as many viewers on release in 2012 as blockbusters such as The Dark Knight Rises or The Hunger Games; however, like both those films in different ways, the aesthetics of its design depend on the evocation of resemblance to (and sometimes direct incorporation of) images from recent conflicts to incorporate narratives about the nature of war and violence in the present or recent past into the texture of a speculative setting. Such evocation in Coriolanus primarily occurs through the conjunction of material space and the costumed, performing body. Much of what this adaptation can tell scholars of international politics would not therefore be contained at all in the elements of audiovisual narrative, such as dialogue and story, with which researchers accustomed to written texts who study popular culture may be most comfortable. Similarly, much of what this adaptation can tell scholars of international politics would not be perceptible at all without applying a ‘feminist curiosity’ (to quote Cynthia Enloe) and a ‘queer intellectual curiosity’ (Cynthia Weber), to start perceiving how its constructions of war and violence are constituted by ideas about gender, masculinities, desire and the body. The combination – what we might call a feminist aesthetic curiosity – could reveal much about the continuum between representation and imagination, mimesis and speculation, through which creators, spectators and even military institutions produce and contest ideas about violence, gender and war. This post originally appeared at the Forum Transregionale Studien (TRAFO) blog on 14 September 2016. Six years after I finished my doctoral research at University College London’s School of Slavonic and East European Studies, two years after I had briefly returned to SSEES as a teaching fellow leading Masters modules about nationalism and ethnic conflict, students at UCL launched a campaign against Eurocentric and institutionally racist structures of thought within the curriculum that they termed ‘Why Is My Curriculum White?’. The campaign, which began in 2014 and spread to other UK universities including Leeds, Birmingham and Warwick, framed its title as a challenge which, if a teacher were to answer it, would involve unpicking a complex of assumptions about rationality, modernity, and which people and places have become entitled to set themselves at the intellectual centre of producing knowledge about the rest of the world. Exposing the ‘unmarked nature’ of whiteness in the design of teaching and learning, and the unquestioned assumptions about which scholars represent the theoretical heart of a discipline and which are added on as marginal radicals or providers of empirical area-specific knowledge, would thus be the first step in ‘dismantling’ the white curriculum and starting to decolonise the university, alongside confronting structural racism in the academy itself (as a panel discussion at UCL organised by Nathaniel Adam Tobias Coleman had asked earlier in 2014: ‘Why isn’t my professor black?’). The subtle dynamics of reproducing whiteness through the hierarchies of authority that teachers construct when suggesting the centres and margins of their field are illustrated by Anna Agathangelou and L H M Ling’s evocative metaphor, well-known to decolonial, postcolonial, feminist and queer scholars in International Relations, of the ‘House of IR’. Agathangelou and Ling consciously model their illustration on a colonial home: the intimate exclusions within/outwith the domestic compounds of Dutch-colonised Indonesia and French-colonised Indochina that the global historian Ann Laura Stoler has detailed in her own work. The House thus has its founding fathers (individualist, masculinist realism), its good liberal mothers and daughters, its rebel critical-theorist sons, its fallen daughters (postmodernists and queers), its acknowledged and unacknowledged descendants inside and out, and its downstairs, where the ‘servants’ – IR’s ‘non-Western, nonwhite sources of knowledge, traditions, or worlds’ – ‘live, work, and produce for the House of IR’ (Agathangelou and Ling 2004: 27, 30). Anticipating the #RhodesMustFall protests of 2015–16 about the unacknowledged legacies of colonialism and slavery on elite campuses in South Africa and Britain, and the ongoing struggles at US universities to confront the material and symbolic legacies of slave-owning benefactors, the UCL ‘Dismantling the Master’s House’ group also drew attention to the presence of the colonial past of their specific institutional setting: the commemoration of Francis Galton, who founded eugenics as a scientific field at UCL, in the 21st-century university’s public culture. If I had still been teaching at SSEES in 2014–15, how would I have answered the question ‘Why Is My Curriculum White?’ when looking at my own modules, or connected the history of an east European studies institute (founded in WW1 by scholars who were lobbying the British government to support Slav national liberation movements’ struggle against Austria-Hungary, later part of Britain’s Cold War infrastructure of knowledge, intelligence and research) to the colonial legacies of the university that SSEES had joined in 1999? What texts would someone need to add in order to bring race into the centre of the discipline’s debates, alongside its central paradigms of ‘nationalism’ and ‘ethnicity’ – or even to integrate histories of people of colour in central and south-east Europe into the core narrative of the region that an undergraduate historian would take away? Did this subset of area studies, about a region of Europe which had been repeatedly occupied and which had never been the metropole of an overseas empire itself, need to reckon with whiteness and the global history of ‘race’ to the same extent as the history of Britain or America, the Netherlands or France? Yet at the same time the ‘House of South-East European Studies’ – especially the interdisciplinary south-east European cultural studies/history/anthropology in which I positioned my doctoral work – would give critical inquiry based on postcolonial thought much more space upstairs than its equivalent ‘House of IR’. Since the early 1990s, a research agenda translating the premises of Edward Said’s Orientalism to south-east Europe, first developed by Milica Bakić-Hayden (with Robert Hayden and alone) and Maria Todorova, has suggested that the politics of differentiating a civilised and urban ‘Europe’ from a backward ‘Balkans’, a fundamental identity-making project both outside and within the region, depend on symbolic hierarchies similar to, or perhaps part of the same structures as, orientalising oppositions between ‘Europe’ and ‘the East’. Questions of essentialisation, othering, stereotyping, exotification and mis/representation are inescapable in the study of post-socialist identities – with immediate opportunities, in the majority white and Anglophone classrooms where I teach, for reflecting on similar (perhaps connected; perhaps, too, not automatically identical) dynamics of othering and periphery-making directed towards the Middle East, Africa, South or East Asia, Latin America, Islam, or even Ireland. For me, however, the construct of the ‘House of South-East European Studies’ I’ve postulated is a retrofitted house. The disciplinary conversations I was part of during my PhD were parallel to, but largely separate from, those taking place in other fields that grounded their knowledge in specific languages and regions. Unlike contributors to this forum for transregional research who have positioned themselves in International Relations throughout their careers, I began engaging with IR (to which I had first been drawn as an undergraduate via the possibilities it offered for studying women and war, even if it meant reading against the grain of an intro syllabus largely devoted to explaining the English School) first because its critical and feminist studies of peacekeeping offered a conceptual language for connecting south-east Europe as a site of international intervention with the rest of the world, then because its emerging and hard-fought aesthetic, experiential and queer turns helped to explain why many of my interests in cultural politics had run together. While it has taken extensive struggle by postcolonial and decolonial scholars to make race and racism a theoretical lens within IR, my own re-entry to IR – giving me a mental map where the margins of Agathangelou and Ling’s House look more like a centre – is what persuaded me, once the Why Is My Curriculum White? group posed the question, that situating south-east Europe in a global International Relations or a global history of anything else must involve situating the region in global dynamics of ‘race’ – a concept which, in contrast to ‘ethnicity’ or ‘postcolonialism’, is more isolated from the central conversation in the first discipline to which I belonged. South-East Europe – like ‘central Europe’, ‘eastern Europe’ or ‘the former Soviet Union’, but also part of a transregional ‘post-Ottoman’ space – sits in an ambiguous position in the global history of race and imperialism. Ruled by the Ottoman, Habsburg and Venetian empires, cast into the periphery of ‘Eastern Europe’ during and after state socialism, and with the deepest colonial legacy in the region (that of the Ottoman empire) being left by a power that in northern/western frames of Europeanness was either on the margins of Europe or outside Europe altogether, it was never the metropole of an overseas empire. Migrants from south-east Europe moving to postcolonial European countries or settler-colonial states have been subject to changing and conflicting frameworks of identifying with and ascribing race: having to ‘learn to become white’ (and to become complicit in whiteness, racism and settler colonialism) like other southern Europeans in early 20th-century North America, with access conditional on politics (not being a Communist or anarchist) as well as phenotype; being told ‘At least you’re the right colour’ by white neighbours offering – extremely conditional – acceptance to Bosnian refugees in late 20th-century Australia; being incorporated into the racialised category of ‘east Europeans’ in post-EU-enlargement Britain; and these are only three examples of the conjunctions between race, ethnicity, class, migration policy and history encountered by south-east European migrants and diasporas. A common European antiziganism, inflected by distinct but comparable national identity discourses, marginalises Roma in south-east Europe and when they migrate to the West; while some Romanian migrants in western Europe deploy antiziganist constructions of Romanian nationhood in order to distance themselves from Roma in their host society’s racialising gaze. The subaltern identification that adaptations of postcolonial theory has given south-east Europe can explain much about the region’s peripheral position but also sits uneasily with the investments in whiteness as well as Europeanness that postsocialist national identity projects have made, from widespread antiziganist media and everyday rhetoric, to occasional but unquestioned appearances of blackface performance on entertainment television, to the Slovenian and Croatian governments’ emphatic stance during the current refugee crisis that their states should be countries of managed transit – or no transit at all – not countries of settlement. Anikó Imre, writing on whiteness and antiziganism in postsocialist eastern European media (including her 2005 essay ‘Whiteness in Post-Socialist Eastern Europe: the Time of the Gypsies, the End of Race’, and more recently ‘Postcolonial Media Studies in Postcolonial Europe’), and Dušan Bjelić, in essays on Balkan involvement in the colonization of Palestine and on the identity discourses of Kristeva and Žižek, both argue that south-east Europe would not stand outside the dynamics of coloniality and race that Global IR can place at the centre of the discipline’s inquiry. Research like Miglena Todorova’s PhD ‘Race Travels: Whiteness and Modernity Across National Borders’, on Bulgarian identity and global formations of race throughout the 20th century, completed in 2006 (the same year she published an article on National Geographic and the Balkans), exemplifies the questions about race I wanted to incorporate into my teaching about ethnicity and nationhood at SSEES in 2011–12 but did not have the architecture to properly build. Academic publishing’s economics of ‘market’ that render small nations and ‘niche’ topics supposedly uncommercial are part of a politics and technology of knowledge production that restrict the opportunities for innovative scholarship about and from peripheralised regions to be made widely available in book form, while unmarked methodological nationalism among readers, instructors and reviewers can produce an exceptionalism of its own. ‘Connected histories’ thus fail to be connected not even because connections are never made, but because connections are made, missed, remade, and liable to be missed again. During a collaboration with Jelena Obradović-Wochnik on ‘the nexus between peacebuilding and transitional justice’ – two fields where critical research asks similar questions about knowledge/accountability gaps, ‘liberal peace’ assumptions and the structural inequalities between international intervention agencies and local residents, yet which rarely seem to engage with each other – we had initially been surprised to find so little theoretical bridge-building between the fields when perspectives ‘from the ground up’ (knowledges based on everyday discourse, oral history, ethnography) made the shortcomings of peacebuilding and of transitional justice appear as two instances of the same problem. The theoretical connections we needed were already ‘there’, in the work of Chandra Lekha Sriram and Rama Mani; but neither had been extensively cited into the conversations about the liberal peace where we began. Working transregionally in south-east European studies overlaps with, and may often be informed by, the ambitions of Global IR. As a researcher located at and educated in a centre of knowledge production ‘about’ the rest of the world which has that status as a legacy of colonial-era higher education and research, however, I do not wish to suggest it is a ‘new’ lens, far less to impose another hierarchy of progress and temporality in suggesting that in some way the field ought to ‘catch up’. Instead, it is a lens that the centre of the field has failed to see through to the same extent as it has seen through lenses of ethnonationalism or even postcoloniality – and a lens that can permit old as well as new histories and solidarities to come into view.